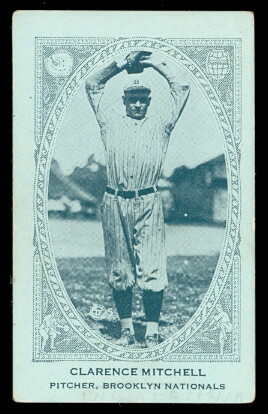 DAVE'S VINTAGE BASEBALL CARDS PRESENTS E120 1922 American Caramel Baseball Series of 240 Cards. Issued by The American Caramel Co., is one of the most popular Sets of the 1920's and was distributed with caramel candy. This is an unnumbered Set and the cards measure 2" X 3 1/2". 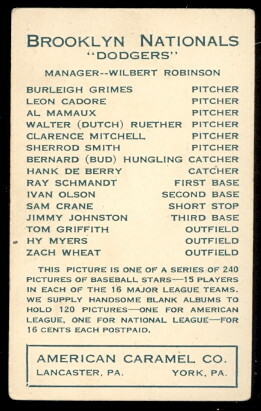 They show players from the American League (printed on cream cardboard) and National League (printed on green - blue green cardboard). The fronts show actual photographs of the player with position and Team. The backs show the Team checklist. 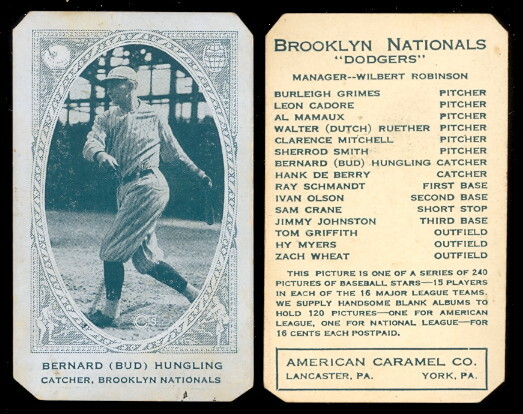 Both an American and National League Albums were available as well. At the bottom is Mfg. by American Caramel Co., Lancaster and York, PA.